Teapots and Polka Dots: A Dessert Worth the Splurge? I was buying a few books at my local chain bookstore and saw this single-issue glossy magazine at the checkout line. The cover photo called out to me. "Hey-ay!," it beckoned. "Come try me for your next reeeeally special dinner party!" So like a greedy fool, I bought the magazine (and it wasn't cheap!) and whisked it home. When I leafed through the publication, I was dismayed. Many of the recipes relied heavily on packaged foods, like frozen whipped topping, artificially flavored cream cheese, and packaged cake mixes. The food was relentlessly artery-clogging and not very innovative. 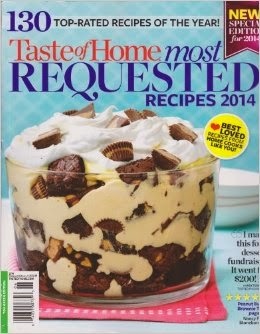 And the cover recipe? It calls for brownies made from a mix. Worse yet, what I mistook for a Crême Anglaise was actually vanilla Jell-O pudding. If I'm going to ingest some serious calories on dessert, I want to be eating homemade brownies and a sauce that starts with eggs, heavy cream, sugar, and real vanilla extract. I might some day try to re-create this recipe, but with all elements made from scratch. If I do, however, the Reese's cups get a pass. No sense trying to mess with perfection.